Work to make imagination a reality! At Veridiam, our team of proud and innovative people engineer and manufacture highly customized, precision metal components for Fortune 500 medical, dental, aerospace and energy clients. Our employees thrive on developing creative solutions to our customers’ complex and specialized requests using state of the art manufacturing technology that makes a difference in the quality of people’s lives. If you enjoy working in a dynamic and energetic environment, want to be treated with respect, and are interested in continual learning and development, Veridiam might be a good choice for you. As a high-growth company we offer you job stability, exciting training programs, and exceptional career opportunities. Please use the links below to view our current job openings by Veridiam location. Just click on the job title for a complete description of the job. There is a link at the bottom of the job posting to send us an email if you would like to apply. We hope to hear from you. We take great pride in providing a positive, professional manufacturing environment in which our employees are given ample opportunity to gain the knowledge, skills, abilities and education they need to contribute to their personal success and the future success of Veridiam. To support that commitment, we have developed Veridiam University, home to our internal training and development initiatives. In order to engage and retain the highest caliber employees, we are committed to providing training and development opportunities at all levels in the organization throughout your career with us. Our commitment begins with our New Employee Orientation and continues with on the job training in your department as well as other training classes that always include a hands-on or interactive component. Every team member at Veridiam needs to possess a set of core fundamental skills. Due to the specialized nature of our business, we cannot expect new hires to enter our organization with these skills, and we are committed to providing them. As a result, we have developed a structured and timely technical training program for our operators/machinists. The following classes help sustain our core competencies and our competitive advantage – our employees! A 2 year, in-house “apprenticeship” program designed to train and develop machinists from within the organization. Upon completion of the curriculum and on the job training requirements, we believe our graduates will feel confident that they have the complete set of skills and abilities to immediately perform at a highly proficient level as a machinist on our shop floor. All new leaders to Veridiam, whether recently hired or newly promoted, are introduced to our Supervisor Core Curriculum within six months. These courses mirror our culture and provide leaders with the background and tools to help effectively lead teams of employees. In addition to the core curriculum, we regularly offer additional leadership training to stay current on best business practices as we continue our quest to be recognized as an employer of choice. The American Society for Training & Development selected Veridiam to receive the 2012 Excellence in Practice Award for our on-the-job training checklist program. The Excellence in Practice Award program recognizes organizations for results achieved through training and development practices and solutions. Awards are presented to organizations with proven practices that have delivered measurable results in achieving organizational goals. To learn more about Veridiam’s training programs, click here. The San Diego Society for Human Resources Management has recognized Veridiam for our innovative on-the-job training checklist program, and they awarded the company with the coveted Marble Award. Read more at the full press release. Veridiam won the 2012 Silver Brandon Hall Excellence in Learning Award for the “Best in Competencies and Skill Development” category. Veridiam received this national award for the development, implementation and results achieved from our on-the-job training checklist program. To learn more about our training programs at Veridiam, click here. The San Diego chapter of the American Society for Training & Development (ASTD) selected Veridiam as a finalist for the 2012 PEAK (Performance Excellence and Applied Learning) Award. Only 3 companies in San Diego were selected as finalists for this prestigious award. Veridiam was selected as finalist for the development, implementation and results achieved from our on-the-job training checklist program. Veridiam has won the prestigious Crystal Award in the mid-size company category at the 2009 Workplace Excellence Awards. 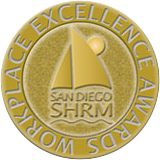 The awards are sponsored by the San Diego Society for Human Resource Management and recognize innovative and exceptional human resources practices.